Molt is the process of feather replacement. All birds do it; they have to grow new feathers once or twice a year to stay warm, dry, and airborne, and in many cases they grow differently colored feathers at different seasons to match their surroundings or to impress others of their species. Among the small songbirds, virtually all species have a complete molt (replacing all of their feathers) in late summer, and in addition many species have a partial molt (replacing some of the body feathers but not the wing or tail feathers) in the spring. American Goldfinch follows this pattern. Beginning in September, and continuing for six to eight weeks, they molt all of their feathers, ending up with a completely new and pristine set of feathers (and drab colors) as they head into the winter. In the spring, as they grow new body feathers the males especially transform into bright yellow breeding plumage, but the wing and tail feathers remain from the previous fall. As these wing feathers get older the pale buff edges fade to white and disintegrate, so that by the end of the summer the wings look essentially all black. And in September another complete molt begins. Watch the slideshow, or click on the main image to advance, and see what other patterns you can notice. First signs of molt to breeding plumage show, especially around the head. Pale edges on the wing feathers continue to wear and fade, and bill color begins to change to pale orange. Molt of head and body to breeding plumage continues rapidly, with more yellow and black feathers around the head around the head and yellow on the body. Pale edges on the wing feathers continue to wear and fade, and bill color begins to change to pale orange. Molt of head and body to breeding plumage nearly finished, with just a few grayish feathers remaining on nape and back. This molt does not include the wings and tail, so pale edges on the wing feathers continue to wear and fade. Bill color is fully pale orange. Full breeding plumage. Wing feathers continue to fade and wear. The spring molt is only partial (head and body but not including the wings and tail), so the wing feathers are now eight months old and going another 5 months. Full breeding plumage. Wing feathers are now nine months old and continue to fade and wear. Full breeding plumage, showing some signs of wear. Wing feathers are now ten months old and continue to fade and wear. Full breeding plumage, showing some signs of wear on the body. Wing feathers – now nearly a year old – continue to fade and wear, at this stage often all-black without obvious wingbars, just very narrow pale fringes remaining. Beginning molt to nonbreeding plumage, with many new grayish feathers on head and body replacing the yellow and black of breeding plumage. Wing feathers are replaced beginning with the innermost (close to the back) and the new feathers with broad buffy tips and edges contrast with the old, worn, all-black feathers. Bill color begins to change to dusky winter color. Molt to nonbreeding plumage nearly complete, with just a few bright yellow breeding feathers remaining. Wing feathers all new with very broad and buffy edges. Bill color drab dark grayish. Complete nonbreeding plumage, all feathers fresh. Complete nonbreeding plumage, beginning to show some signs of wear and fading on the wing feathers, as wingbars become narrower and paler. David, I’m glad you enabled the slideshow feature. I showed it to my adult school birding class and they absolutely loved it. We all think that molt sequences like this should be included in the next update of your iPhone, iPad app, as well as your next edition of the printed guides…. no pressure. Thanks again for a great job! David, This post is brilliant. I love watching the wing feathers come in and then wear down. Thank you. You inspire me in both my art and observation. Hi Jack, and thanks! I can’t wait to see your book. I have been a city girll all my life moved to the county just 6 years ago first thing that attracted me was all the beautiful birds. 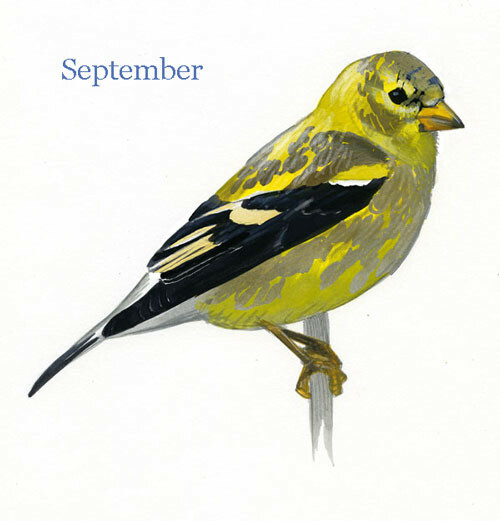 One of my favorites have been the Goldfinch’s. I just recently found out that they actully don’t leave they change color in the winter! Found your site I learned so much thank you for inspiring more. Is there any genetic basis for the change in feather color or does this result solely based on the environmental surroundings? I am trying to determine if this is considered an adaptation or if it is an example of phenotypic plasticity. Hi Eileen, This seasonal color change is mainly genetic, an adaptation that allows the males to show off bright colors to females. The pigments in their feathers are carotenoids that are directly linked to immune system functions. Therefore a healthy male that has a lot of carotenoids to spare will grow nice bright feathers, and color is an “honest” signal of health. Goldfinches, like most small songbirds, molt twice each year. The molt itself and the difference in color between breeding and nonbreeding plumage is genetically programmed, but the “trigger” that determines whether the new feathers will grow in bright or drab is hormonal. I hope that makes sense and answers your question. If so many goldfinches shed all their feathers twice a year, why don’t we find the feathers on the ground? A goldfinch once hit our window and the tiny feathers remaining were half yellow and a half gray, so I think it’s just the color that changes, not the feathers. Could that be right? We have goldfinch at our feeder daily. A few weeks back I noticed a lot of yellow feathers blown into a corner on our patio. I pointed them out to my husband and it remained a mystery to us until I read the color change David explained. We didn’t know that the male changes color until this fall season began. We’ve never had an opportunity for consistent observation until 2018. Thanks so much for your expertise, David! David, I live in Georgia and enjoy goldfinches greatly. One observation I have made is a very small yellow spot at the base of the tail in late winter. These birds look like goldfinches, yet I am unsure. I would love to supply a photograph, but alas, I have been unsuccessful.Please advise if possible. I have heard that the hormonal response is triggered by the goldfinch eating certain berries. Is there anything to that? David, I live in Toronto. We have been feeding goldfinches all winter on Niger seed. Today I have seen a gold(? )finch that was almost white, except for the wings, which were normal for spring here. The black cap looked almost fake, but not quite a crest, and the eyes seemed to protrude… almost as if he were wearing a mask. He looked like he needed some preening, a bit tousled. He (?) has been back to the feeder several times today. Sat Apr 26. I noticed a big change at my feeders over the weekend all of a sudden there is less activity. My orioles I assume have left for warn climes. May I assume the absence of my goldfinches is they are molting? We’ve also had terribly rainy, stormy weather could it be a combination of those two factors ? I sure am missing seeing all the birds every morning! Wow! Fantastic. Now I’m looking forward to the day when I can view how those pesky autumn ducks get to the point where they confuse me. I’ve had a pair of goldfinches sporadically throughout the year here in Michigan, and suddenly I have about a dozen regulars. I was wondering why I was seeing all “females” until it occurred to me that I might be seeing males with winter plumage. Thanks for a useful site. Just wondering if this hormonal change that causes drab vs. bright coloration is triggered by the amount of daylight. The food/diet available in the winter has not changed, yet the goldfinches color is definitely beginning to brighten. A very effective way of showing the cycle of moult. Congratulations. We are watching the goldfinches at our 2 feeders (scrappy little birds! ), dozens of them, along with bluebirds (6! ), redpolls & pine siskins. We have birder friends who say that the goldfinches say “Potato chip!” when they call & fly like potato chips. And yes, the males are just beginning to brighten up. Where is the link for the January through December plumage slides? Hi Frank, It got lost when I updated the website — Fixed now, sorry about that. A friend sent me a picture of a male American Goldfinch in full breeding colors in January in the Upper Peninsula of Michigan. Her theory is that it was a juvenile born late in the season and missed molting. Have any ideas on this? Thanks! I live in central Arkansas, near Hot Springs. I have large numbers of goldfinches at my feeders, and they are in winter plumage, as expected. A friend, who recently moved to the area (about 3 miles away), claims she has male goldfinches in full yellow plumage. It’s mid-January, plenty cold, and I’ve never seen bright males at this time of year. How can this be? Spent hours trying to figure out what was at the feeder, who knew the goldfinch changed with the months. Great post thanks so much.